"One of the easiest apps I've used for any type of form creation"
The main functionality when putting forms together is very smooth and intuitive. We can drag fields into place and rearrange things like puzzle pieces. I don't have to understand programming or how data connects to this database and such. I just put the form together and let the information come in. JotForm has hosted forms that usually run very quick. I don't have to worry much about downtime since JotForm's servers seem to be very high quality. I know they're much higher quality than the servers we use for some of our websites. I can't create the exact type of fields that I want all of the time. For me, JotForm can really handle conditional questions as intuitively as I'd like. JotForm is mainly suitable for standard web forms. It can do more than the typical web form, but the overall user experience isn't as dynamic as some forms I've seen out there. JotForm should work well for most online form needs. If you don't need your forms to look and work in a very specific way, it can be a great tool for your business to create forms and acquire data fast. I've benefited from the simple tools JotForm provides for creating forms. I can put together most forms I need in less than an half an hour. The form processing is very reliable and has never failed to send me information, as far as I know. We can use data from the JotForm forms to analyze our service, client needs and various trends we're trying to track. "Creates engaging digital forms quickly and easily"
JotForm has simple tools for creating professional and reliable digital forms. Even though I have a bit of programming experience, I didn't need any of it to use JotForm to the fullest. The look and functionality of the forms, regardless of the template or design used, is generally very pleasant and engaging. The layout is simple and spaced neatly so that users won't be confused about what they need to do. The form creation tools are intuitive and make it easy for us to edit the forms. The pricing is very reasonable. Though I like the design of most templates, I'd like to have more precise design options. It would be great to be able to tailor the look to match particular branding and marketing material designs. About the functionality of the forms, if you don't plan out your questions properly, the final form could load in a confusing fashion for your users. 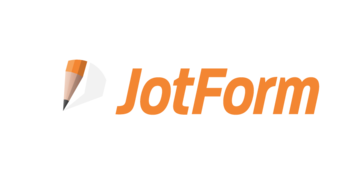 I think JotForm is a great solution for small businesses that want to distribute online forms in a quick, simple and professional manner. Though there is a limit to how much you can tailor the look and functionality to your needs, the capabilities of JotForm should be sufficient for common form needs. It is very versatile and can be used for a wide range of applications. We use JotForm to send out surveys, registration forms, suggestion requests and other business-related forms to our clients. We also occasionally use it for compiling feedback information from colleagues and vendors. It has worked well in some collaboration scenarios when we needed to compile information quickly. Overall, the data we obtain through JotForm has given us a strong return on our investment. It has helped us to refine our marketing efforts and improve our quality of service. "An engaging and streamlined form creation tool"
The overall layout and design of default JotForm forms is very pleasant and easy to use. It stands out from many standard online forms that are rigid and unresponsive to your answers. I like that JotForm can change the path of questions based on how certain questions are answered. There is a strong interactive feel to JotForm forms and I think it helps to make users more engaged and actually complete our forms. The controls and user interface in JotForm are simple and easy to use. We can simple drag certain fields into place and make adjustments in an smooth and intuitive fashion. Customizing the form designs can be a bit tricky. Also, though I like the look and feel of most JotForm forms, it would be great to have the option to create more standard forms that have fields in fixed positions. There may be templates that allow for this, but it's not obvious to me at this point how to implement that. I believe that JotForm can be a great tool for most businesses to create professional and engaging online forms that can be made quickly. You can reduce possible coding and server errors since JotForm handles the coding and hosting of your forms. We use JotForm to create dynamic forms to acquire responses regarding client feedback, registrations and promotional signups. We can save hosting space by not having to upload forms to our web server. Unlike forms we might create ourselves, JotForm provides us with user and form submission data that helps us to refine future forms to improve conversion rates. "Fast and Easy Way to Create Professional Forms"
Building and customizing forms is a very easy process. I can create 10-20 question forms in minutes and embed them on our websites. I can also configure the forms so that multiple staff can receive email notifications when new forms are submitted. In addition, we can easily export the responses to PDF, Excel and CSV (as of this writing). Since we started using JotForm years ago, they have added a lot of additional features via widgets and website/app integrations which really makes the whole process of building multiple forms and collecting data very easy to manage. The settings related to configuring notification emails is not always intuitive, though it's a minor drawback. You can take JotForm for a test run using their limited, free plan. If planning to purchase, considering do so at the end of the year, to take advantage of significant discounts on subscription plans. There are also numerous plug-ins that will allow you to add a variety of features to the form, such as eCommerce capabilities. There are also numerous plug-ins that will allow you to add a variety features to the form, or work with form submissions (for example the new PDF editor). If collecting healthcare data, they now have HIPAA compliant form builders/data collectors. We had stumbled upon JotForm years ago while searching for a form builder that would allow users to submit content. At the time, there were very few free or affordable options. We use it regularly now for our member elections and awards nominations. "A quick way to get professional submit forms posted online"
I really like the ease and simplicity of JotForm's form creation tools. I've worked a bit with PHP forms and forms generated through web content management systems and found that JotForm is a much more reliable form creator that can get our forms up and running much faster. Since JotForm's forms are hosted through JotForm, we don't have to worry about programming issues or updating code to maintain server-side compliance. The pricing for the premium plans are very reasonable. There is a limit to how much you can design the look and functionality of JotForm forms. If you have complex forms that need to process files or redirect users depending on their responses, JotForm isn't a well-suite platform for that. I think JotForm could be very helpful to your company if you don't have the resources to produce customized online forms. If you want to give the links a more customized look, you may consider creating a redirect link on your website that leads to the JotForm form. That will allow you to have a shorter link with your company's domain name in it. That could give the link a more professional look. We use JotForm to create a variety of submit forms that are linkable from our web assets and social media accounts. We can get forms created quickly and use the data for a wide range of purposes like surveys, feedback and event registration. JotForm is very easy to use. You have templates readily available if you don't have the time to create one yourself. You can also create one from scratch and customize it the way you like to mirror your product/company's aesthetic. You also have the option to add all the questions you can think of so it covers a lot of markets. I don't have anything that I dislike about JotForm. Probably a suggestion. When using the select date section on a desktop, it's hard clicking on that tiny calendar thingy to pop up and select the date. Other than that, I don't see anything else that I would dislike about this service. It's very easy to use. It has a free version too, so you can test it out and see if it works for you before subscribing. We were getting flooded with inquiries. Creating an inquiry form with JotForm helped us to make sure we get each and every inquiry processed. Imagine getting hundreds of text messages and calls a day. We had a hard time keeping up. But since JotForm saves the data from clients and sends it to us, it was easy to just send emails to the clients one by one. After we used jotform, our clients also had a positive experience with dealing with us since they don't have to wait on the line or wait for an SMS response from us. Once they fill out a form, they know we got their inquiry since JotForm sends an auto reply, and has a thank you page that is fully customizable. "Watch out for your account to be suspended for no reason"
What I like best is Jotform forced me to look for alternatives and there seems to be several out there. I settled on Zoho as I am using some of their other great products. I'm glad I did because their editor is much easier to use as the Jotform one is very buggy. After using Jotform for years, I noticed that our account was suspended. No notice whatsoever and no explanation. With no notice, you find out the hard way when you actually need it. I tried to email support 3 times and each time you click "submit" it says "please wait..." indefinitely. I tried multiple browsers and machines so you can't even reach support to find out why your account is suspend. A website error you would expect from your local flower shop, not a global company. A day later, the support message gets through. No notice on twitter or on the website that there was technical difficulties. A day later and still no email reply from JotForm. Again, not what you would expect from a global company. Do what I did and google "jotform account suspended" and prepare to be shocked. There have been school teachers, students, business, freelancers, travel agencies, and others that have had their accounts suspended because we are flagged for phishing! According to their TOS, when you collect personally identifiable information that is phishing. Collecting a name could be considered phishing. Just like many of these others, many accounts were never reactivated even after these businesses and people explained how their forms were for legitimate causes! Don't take the risk. There are many other superior form builders out there... both paid and free. The exact opposite. Business comes to a halt because you are surprised into finding out your account is suspended! I like that that it is free for small needs and really cost-effective for larger needs. Sometimes we could predict certain months where we knew we would pass our free quota, so we could enroll in an actual plan for that one month alone, then cancel the plan after that one month. It is also really easy to use! At our University, it would take someone a week to build something for us on the webpage, so with Jotform, I can set up my form within the day and have it to use and modify immediately. They did an update within the last year that was VERY confusing. I prefer the prior version. We primarily use Jotform for event registration. The registration information exports into a really clean excel sheet that we can use to mail merge nametags, business cards, attendee folders, etc. Jotform also allows us to NOT rely on our own University's tech staff to make a form. "JotForm has enabled me to collect customer information so efficiently "
I really like that JotForm is so easy to use. The setup and templates enable you to create the exact form that you had pictured to begin with. There are so many elements you can add to your form to capture the exact data you were hoping to. They even have the option to add payment and widget elements! One thing I would like to see improve with JotForm is the customer service. We had created a form to use for professional matters and it got turned off. We tried contacting the company to resolve the issue and gain back access to the form, but rather ended up having to create a whole new form since we never heard back. I really like where JotForm is right now. I would recommend a little more response from the customer support end of things. As I previously mentioned, there was a time where my company needed to regain access to forms but were unable to contact someone to do so. I am able to successfully and efficiently capture customer's information in an advanced way when using JotForm. It is so easy to create a form and present it to customers. I receive emails with copies of the form in order to document to refer to later. A client wanted to produce a program for their upcoming choir production. This program would include paid ads that were placed by friends and family. We needed a simply way to allow the purchase of an ad as well as the sending of the artwork to our art department. Enter JotForms! By creating a simple online form, persons wishing to purchase an ad simply fill out this form, attach their artwork and pay for the ad all online! A JotForm form is very easy to set up and works with many different credit card processors, including PayPal and SquareUp. When designing a form, tweaking the design sometimes requires CSS. However in their latest update, this has been simplified tremendously! Recently JotForms introduced "Cards". These 'cards' make form design even easier! Your forms can be embedded in most of today's social media platform and websites. Do yourself a favor and check out JotForms. The product is very easy to use, yet the functionality is intense! Needed a way for a local choir to be able to sell ads in their programs. Since our company was doing the program design, it was too great a hassle to have these ads sent to the choir. We had to come up with a simple and effective way for the persons ordering ads to pay for and send their artwork to us in one step. JotForms allowed us to do this very easily! "Great simple survey software; some limitations"
Very user friendly when setting up the surveys. Drag-and-drop elements. And, helpful that you can clone existing surveys to carry formatting over. I'd like to see more options when it comes to formatting (color/pattern/etc) for the background. More importantly, an easier way to route surveys through a workflow based on what is entered. We are currently creating a couple of internal docs that need to be routed to supervisors. The surveys are designed to send to one email address, but we need to create odd workarounds to get these routed to different supervisors based on who is completing the form. I think a lot of companies would benefit from some more advanced options that allow this. JotForm has been incredibly beneficial for us to gather information both internally and externally. We have a form set up that guides clients step-by-step through an information-gathering process. They answer questions and are able to attach supporting documents right in the JotForm. Internally, we use it for tracking leads, submitting accounting requests, etc. "El mejor creador de formularios"
Destacaría su interfaz, ya que es muy intuitiva y fácil de usar. Jotform posee un maravilloso conjunto de plantillas en su biblioteca y estan organizadas segun el sector en el que estés interesado, así que existe una gran facilidad para la busqueda. La posibilidad de integrar aplicaciones y widgets de terceros también destaca entre las cosas mas positivas de este creador de formularios mejorando el aspecto del formulario notablemente. Si tienes una empresa pequeña o eres un usuario independiente, la cuenta gratuita te ofrece muchas posibilidades para crear formularios. Por último también destacaría la función del foro del soporte técnico que funciona perfectamente. Jotform es una herramienta perfecta, no destacaría nada como negativo en cuanto a su uso. JotForm es perfecta para la persona que crea realizar formularios de forma casual, así como para las mequeñas y medianas empresas. Existen suficientes herramientas gratuitas para comenzar y un plan mensual a muy buen precio. El editor es muy intuitivo y magnifico su soporte técnico. La posibilidad de realizar formularios y obtener así datos sobre el cliente es el mayor beneficio que se puede obtener de Jotform. "No longer impressed with Jotform"
I have been pleased with the updates to jotform up to now. The program has been responsive and has great features. Today I was sent an email saying I needed to update my credit card. I was give 3 or 4 hours before my account was downgraded and now I cannot update my credit card without upgrading to an entirely new and more expensive account. (They said my former account --which was renewed past Dec of 2019) was grandfathered and they will no longer offer that to me. This is a process that completely lacked integrity and feels like a sneaky way to force people to give up a long term account. This is not the way to reward loyalty! We have been using it for forms to manage reporting from our sales people....now with the limitations and costs of the new account they want us to upgrade to, we will need to be looking for a different product. VERY DISAPPOINTED. The best thing about JotForm is that it's free until you need more than a few forms or require more than a certain number of submissions per month. I also love how easy it is to use. I am not a code writer, so this has given me the ability to create forms and embed them into my work and personal websites on demand without needing to call a programer. Sometimes the design portion of it can be touchy. I will set the line height or font size and then make another adjustment and it erases my previous settings. Non-profits can benefit from using this tool to gather info about their event attendants. Businesses can benefit from using it at trade shows to collect raffle entries, rather than business cards. This way you can give entrants the choice to be followed up with or not and really gauge how well your efforts paid off. Jotform allows people visiting our website to request an appointment very easily. I love that I can add fields as needed. I use it to track how people heard about us. And since it integrates with Google Spreadsheets, I can easily create reports from the info I gather. "JotForm combines powerful form-making features with highly affordable pricing"
8) the fantastic customer support; JotForm support professionals respond quickly and provide helpful assistance. There are also many 3rd party integrations available. To be honest, I really cannot come up with anything currently that we don't like. Whenever I’ve had an issue with a particular functionality, I’ve contacted JotForm support, and they have responded right away with very helpful assistance. They’ve even made updates to their platform functions based on support tickets I’ve submitted, so the platform currently does everything we really want it to do. If you are struggling to figure something out, or something isn’t working properly, contact JotForm support--really! Your message doesn't get lost in cyberspace; they always respond promptly and will do everything they can to help you. For example, at one point I found that certain editing buttons were not working. I submitted a support ticket, and within a few hours, they had corrected the problem and everything was functioning perfectly! Because of all the extra tools (“widgets”) JotForm offers, JotForm enables us to create very sophisticated registration forms for our events and trainings. Using the “Ticket Purchases” widget, we can set registration caps on several individual workshops, and when those caps are met, the system puts a “Workshop full” message on those workshops so that no one else can register for them. We no longer have to monitor our registrations continuously to make sure we don’t end up with too many people signed up for a particular workshop, which was a major hassle! JotForm also enables us to tailor our forms by using skip logic, funneling people through specific questions based on their answers to other questions. This way, we don’t have to have enormously long forms with every possible question listed; people only see those questions that are relevant to them. JotForm has really revolutionized our workflows, and it is incredibly affordable. "Easy to Use for Simple Agreements/Contracts"
I like how easy it is to add/remove questions. The clone feature is also very important to my daily work, so I appreciate how easy it is to clone an existing form. I dislike the options to create a pdf version of the form. Typically, the form does not look at nice or organized in PDF format. I'd also like to be able to export to a Word version, but that option is not available. If you have any paper forms that you send to customers, colleagues, etc. consider using JotForm to make it a quicker and more efficient process. It will save you time and paper! We use JotForm to manage sponsorship agreements. It has been incredibly beneficial and has made our process 100x more efficient. Additionally, the user experience for our sponsors has vastly improved. Instead of having to sign and scan a paper copy of a sponsorship agreement, the online form makes it that much easier, quicker and more efficient to process agreements and get them turned around quickly. "From idea to implementation, Jotform proved to be easy to design with, easy to implement." Easy to get started. If you are already familiar with form elements, like dropdowns, radio buttons (yes vs no), choose one or more, etc, your first form will be ready to go in minutes. Like that the input from the forms can be downloaded into Excel or CSV where it can imported into a database or analyzed in place using Excel sorting, filtering, and, if you desire using more complex logic offered through Excel formulas and programming (VBA). The interface for the person completing the form is clean and intuitive as is form creation. Wish there were a way to enter forms off line and then, later, upload to the cloud. In fairness, did not look at other products. JotForm was recommended as an easy, no/low cost way to get started. Used mostly for surveys and enrollment. Reduces pain and effort of transcribing from paper forms by providing end users with an easy to use and intuitive self-service option. "JotForm - Amazing Form Builder"
JotForm is amazing and I love that they have a free version for those who don't use forms often. There's nothing I dislike about JotForm! It's an amazing program. If you need a form creator that is easy to use, JotForm is for you! There are many options for different business needs, from free for those of us who use it rarely, to $99/mo for those who have greater needs - also, there are options in between too. 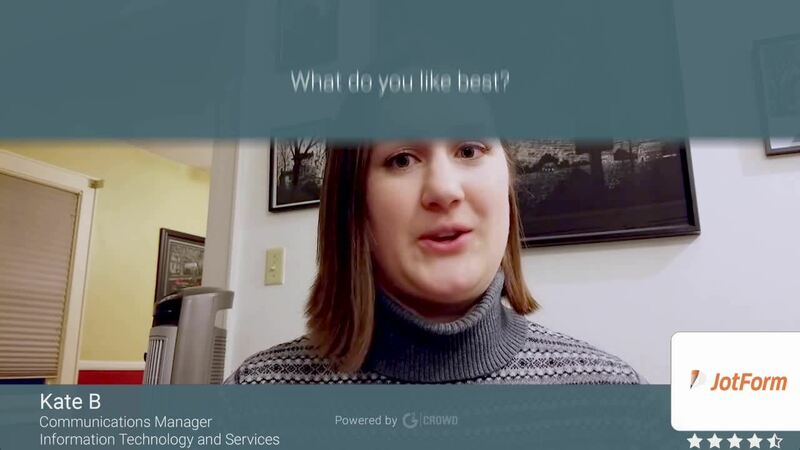 I use Jotform to do questionnaires for clients, submission forms for nominations and applicants to my senior model program in my photography business. It's easy to collect contact information and keep everything easily accessible in spreadsheet format. I don't need a program to subscribe because I don't use forms often - maybe once or twice a year, so the free version is perfect for me! You can easily duplicate forms to and change out information as necessary to save it as a new form without having to type everything all over again! I love it! "El creador de formularios mas sencillo de usar." Para mi es el mejor creador de formularios que existe hoy en día. En primer lugar porque es muy sencillo utilizarlo, no inviertes apenas tiempo en aprender su manejo y eso hoy en día es muy importante dentro de una empresa. Su interfaz es muy fácil de utilizar, y además con JotForm tienes la posibilidad de instertar widgets. En su versión de pago hay muchisimas plantillas, cada elemento de dichas plantillas se puede modificar por lo que puedes realizar tus formularios muy personalizados y al gusto que quiera tu empresa. Por último destacar que en su versión gratuia tienes hasta 5 tipos de plantillas para poder comenzar a utilizar JotForm antes de utilizar su versión de pago. Si quieres disponer de muchisimas plantillas tendrás que utilizar un plan de pago y eso siempre es un inconveniente, pero comparado con otras herramientas el precio es bastante asequible. Quizás el sooprte técnico podría ser un poco mas rápido en dar sus respuestas, varias veces les realice una pregunta y estuvieron un par de días para darme respuesta. Si quieres realizar formularios de la forma mas sencilla posible e invertir poco tiempo de tu jornada laboral en crearlos Jotform es tu herramienta principal. Con JotForm he podido crear muchos formularios para saber el grado de satisfacción de los clientes de mi empresa. "A handy solution for generating quick and efficient online forms"
I like that the forms we create with JotForm have very few submission errors. There isn't any programming knowledge needed to make these forms work. All we have to do is provide the questions and JotForm handles the rest. Most of the forms are clean and easy to use for most everyone we send them to. I like that JotForm provides many templates for us to choose from, which is great when tailoring a form for a specific purpose. There are times when we need more customization options than what JotForm provides. It would be nice to have more advanced options that allow us to automatically link our form submission data with separate databases. Having more customizable form fields with financial calculators and other dynamic variables would also be nice. I'd recommend starting out with one of the many form templates JotForm offers and customizing it as needed. You can likely find a template that closely fits your specifications. If not, JotForm's customer support should be able to steer you in the right direction. They helped us get off the ground with our first few forms. JotForm has been a solid online form solution that allows us to create and post reliable submit forms for a wide range of business purposes. We can acquire feedback data about our services or provide signup forms and contact pages for events and promotions. It's great that we don't have to bother with maintaining web forms on our own server that could be prone to error. JotForm reasonable pricing makes it a great value that fits well within our budget. "Easy to Use Form Resource"
It's easy to create forms with a variety of question styles and complex features through conditional formatting. We are also able to easily integrate the forms we create on our clients' websites. There's not much I dislike, I just hope Jot Form can make their forms ADA compliant in the near future since that is a concern to us and our clients. I prefer JotForm to Google Forms because of the integration options, ease of use, and the fact that you don't have to connect it to a gmail account, especially when using for multiple clients. We no longer have to write code for forms. Anyone one in our office can use the product to create a simple or complex form. It's very beneficial on the reporting front as well. "Create forms with great customizations"
The vast variety of plugins that are provided. I recently created a form where I wanted to use a special type of field and was searching if there is already an inbuilt plugin for that. And voila! it was there and it helped a lot. Also the emails and the form responses were customizable to some extent and it helped alot. Unlimited Emails was the another best thing I liked. The integration with Google sheets is not proper. For example, if you connect a form with a google sheet and then shift the connected sheet tab to a different position, then the integration stops working. Also, the responses are not in the format as we have in Google Forms. Also, need a way to fetch records from existing responses if the user re-enters certain values (ex. email, or some ID). You need to read a lot of guides and study the form completely before going out live. We wanted to create a form with a lot of customizations to questions asked and I was struggling with that with Google forms. And then I came across this form and saw that there is a vast number of plugins and also unlimited emails from your Email ID. It has a very good price, if we want a good result we must pay for it. We generate fomularios that are personalized in the projects that are more special. I would like to get a better customer service, get answers to any questions you may have. Everything else is excellent as a program. Forms of records, the data can be saved in the google spreadsheet which makes it much easier to have to make the same options at all times. You just have to use it to know how good it is, I recommend it without any doubt. This is a solution with very complete characteristics, with it we obtain a much more efficient organization. In the Marketing department with the record of events we have been great. "Crear forularios facilmente con JotForm"
Lo que mas me gustó de Joftform fue su facilidad de uso. La interfaz es muy sencilla de manejar y te adaptas a ella facilmente. Hay una serie de plantillas gratuitas con las que realizar formularios, es una buena opción paa empezar a trabajar con esta herramienta. Fue genial poder integrar a los formularios, imágenes, videos de youtube y otros elementos multimedia. El soporte técnico por chat y email es muy eficiente. Cuando utilice Jotform me gustó todo, ningun problema con esta herramienta. Quizás el tener que pagar para poder utilizar todas sus funciones, pero con la versión gratuita puede llegar a ser suficiente aunque para elminar las marcas te verás obligado a pagar una cuota. Con esta herramienta crear formularios para conocer el grado de satisfacción de los clientes fue mucho mas fácil. I found JotForm to be very user-friendly. I was able to produce 3 somewhat complex online registration forms for an upcoming conference in a couple of hours. The options for layout design options were versatile and the use of the form tools is straightforward. The only limitation I noticed the thus far is related to formatting the output of the Calculation Widget. I am using it to calculating a dollar amount for registration costs and have yet to find a way to have the widget produce the output with a preceding $ symbol. Based on my first impressions, I like this company and the products it offers. I think you wiil too. I needed to produce Registration and Abstract Submission forms for an upcoming research conference. JotForms was the perfect solution. "Nunca fue tan facil crear formularios en linea gracias a jotform"
Me gusta lo fácil que es crear formularios, para ver los envíos, junto con la verdad de que puede cambiar el formulario en cualquier momento, y que los registros solo se muestran en sus informes, sin embargo, no tendría ningún efecto en las revisiones anteriores. Realmente no se le puede tener ninguna queja, o algo que no te guste, realmente jotform es una muy buena herramienta. Una pasada, puedes crear tantos formularios como necesites, al igual que poder diseñarlo a tu gusto e incluirlo en cualquier pagina web. "Easy creating of forms for your business! " There is also a payment option element that is pretty neat. "A good solution for the small company"
The ease of setting up a form was the main seller. We use the integrations frequently including those for Google Drive and Wordpress. Their labeling/tagging system makes organizing your forms and finding what you need much easier. They also offer great templates to can reduce your time spent on creating a form drastically. The site can be glitchy. Their support is lacking. I have submitted support tickets in the past and never received a response back. This is a great solution for a small business with limited form needs. The customization is good but not fully loaded. "Platform with great versatility and highly reliable." It has a reasonable price that adapts to the conditions of the company. Many ways to create and extend complex forms with conditions and logic. It's customizable, which is fantastic. Customer service should improve a bit. That would be the only detail to narrow, everything else works perfectly. It works very well for paid events, since PayPal has integrated very well. Good user interface to drag and drop, with a variety of options for drop-down menus, text areas among others. Registration forms for your website. We have a separate form to generate custom forms for special projects. JotForm integrates very well with our email marketing software, quite easily. In the marketing department we have promoted and organized events that we then use to complete with the attendees. "Great Product; Better than others"
This is the most advanced free form I have seen. I tried many products before finding JotForm and am glad I did. The ability to shrink question sizes, define where the label is displayed, set conditions, and the action that occurs when a form is submitted put it beyond its competitors. It may take a while to fully understand the product, but once understood this is a strong product for your arsenal. There is the occasional bug but this is very minor and does not hinder me at all. Definitely, give it a try, this product definitely has all the right features for me. I had to learn how to use some of it, but it was worth it in the end. I use JotForm for a Registration Form. There are a lot of built-in questions that make getting started with JotForm a breeze. The free version, in which I am using now, allows for a number of submissions and views a month. Plenty for the average non-profit or small business, but with the quality of the tool, I would easily be willing to pay the monthly price should the need arise. "It is excellent for making forms and collecting information about products within the page." I love the features to fill out the forms, the ability to customize the page is fascinating, it is very dynamic and flexible to develop, its interface is great. The integration is simple, fast and easy to use, counting a magnificent support for the client, a real tool to create pages. It is a very complete tool but the space to receive emails from the forms is a bit limited, I would love to have more space. In general I find a fascinating application with a great support. Allowed to collect information about the service offered to customers through an easy and simple form to answer what helped to improve our page according to the responses obtained from users. A true tool excellence. "Easy to use and great interface"
Jotform provides professional, fast and easy forms. They are modern, customizable and work well within webpages. They also offer a non-profit discount on plan pricing! You can also customize colors. Some of the form options can be a little tricky, like "if", "then" questions. Had to try numerous times to get this to work. I also wish the whole form could be viewable on one page instead of separate pages for each question. I wish they had more background themes to choose from. Out of three different form widgets (Google Forms, Typeform and JotForm), JotForm stands out above the rest for their customization capabilities, ease of use, website integration, and form options. We use JotForm for event registration, for questionnaires, follow-up forms, and more. I am no tech wizard by any stretch of the imagination and I was able to create a job application in minutes! Absolutely nothing! There is nothing to dislike! Get it! I can not believe how easy it is to use! And how affordable it is if I need to upgrade! And I love how you can upgrade and/or downgrade at any time! We needed a true online application for our job board. The biggest benefit of all is the cost savings vs the other application system a vendor was trying to sell us. "Easy Form Creation, Fluctuating Billing Structure"
Love the versatility of the form builder, and their emphasis on keeping it compatible with emerging technologies. Their forums are also super-helpful - chances are if you have a question or problem you'll find someone else who's already asked your question and gotten an answer. Jotform has changed it's billing structure a few times while I've been a customer, and it's really frustrating to have forms go offline because you suddenly get switched over to a limited number of form views. Future billing changes need to take into account existing users and make an effort to keep forms online, rather than trying to rake in new revenue from existing users. Make sure you define your use-case before using Jotform - you need to know how many forms, views, fields, etc you want to use before choosing a plan. Collecting data from customers and from within our company. Jotform is incredibly user friendly. Click and drag and in no time you have a professional form that can easily be integrated into a website or email. The software is extensive and offers options for every imaginable scenario. I've used it for multiple situations and it has never disappointed. Really... nothing. As I mentioned above, the software is very user friendly. I can truly think of nothing that I don't like about it. Try it... you will absolutely not be disappointed! We needed a catalog request form for our newly updated website and our website design software did not include a form that could be customized with an address field. I knew that Jotform could do what I needed, so I created multiple forms for several request forms that we needed and they easily integrated with our website. They've been utilized several times already. My bosses were thrilled! "Very Customizable form making platform." Its very customizable to fit any task, allows addition of pay button in the form in case there is application fees to be paid. Its cloud-based making it flexible accessible on any device from anywhere anytime. Sharing of link makes it easy to market the activity or post job vacancy. Instant notifications are sent to your email when someone fills the form. The process of customizing is tedeous and very procedure, pay buttons don't always work it requires some training or much reading to effectively use it. Many marketing messages to email. Jot forms is very professional as compared to its competitors and makes it easy to receive applications in conjuction with any fees required all at one place at the same time. Job posting, paid event organizing, insights collection and surveys. I have used Jotform for JCI Michigan and JCI USA for there trimester and yearly submissions. It has made integrating our Drive for submissions a breeze which in the end helps multiple people have access to review. The user interface is simple and friendly. While the back-end is clear to set up. Needs a office 365 plug in as another drive option that a lot of people use as well, rather than having to use a third party in between. Hundreds of submissions coming in at once this helps us sort items in our google drive and keep it simple for the front end user. It has a high degree of flexibility, being able to add css. The UI is user-friendly, it's very easy to create new forms and they accept high degree of complexity (with conditions and calculation). And it has a high range of ready to use templates, that are suitable for most cases. Sometimes integrations with 3rd party software break and we don't get notified. "More Form then you could imagine "
Even as a person that has little computer skills I was able to navigate the site. Creating the form was simple and step by step. It did take me awhile to figure out how to link my form where I needed it to go. I would like to have been able to chat with someone from the company with questions. Also if this is a feature I haven't used it, I would like to have a way to have submissions sent to my email. We needed a way for customer to refer people to us without having to call us. It is nice to have a separate page for customer to go to for this task. I use JotForm regularly in my job. It's very easy build professional-looking forms to collect a variety of data (i.e., it's not all simple radio buttons and open-ended questions). Forms can be built with an added layer of security, so we don't have to worry about spam when sharing links to the forms. I can configure forms so that notifications are sent to me, to the person responding to the form, other staff (via their JotForm accounts). There are a multitude of useful extensions built by third party developers that I can search for within JotForm. And the platform itself is very affordable, and they have a number of discount offers throughout the year. Configuring email notifications when forms are submitted is still a little confusing and buggy. Confusing because the fields where you supply information about where you want emails to go are written as macros (similar to the way you see in a mail merge) and buggy, because notifications are not always sent to additional accounts as requested. While not really a negative, I'd love to be able to collect all responses in a single worksheet. At present, we can only view submissions piecemeal. The JotForm starter package is free, so you can kick some tires and deploy a limited number of forms right from the start. And, while the packages are quite affordable from the start (<$500 annually), JotForm does offer a number of discounts throughout the year (when signing up for an account, select the option to receive notifications about promotions). The ability to upload a variety of supplemental files to forms was the reason we started using JotForm in the first place - Google Forms and Survey Monkey, the platforms where we normally built forms to collect member data, didn't have that feature. As a result, JotForm allowed us to really streamline our board elections process, awards nominations, and member requests because now, members could upload files to forms electronically rather than submitting separately by email and snail mail. I like that there are a ton of templates to choose from and I like that it is very easy to create a form. The form designer would be a little easier to used especially when you go into the CSS. I also wish the drag and drop was a little more customizable, sometimes I can not always get exactly what I'm going for and the CSS is clunky. This is an an easy to use tool that is quick and intimidate as far as results are concerned. I think a few tweeks to this tool and it would be off the chart excellent. We are able to create a survey on the fly and have it up on our site in a matter of mins. We are also able to track and see the results and get more information on our own. "JotForm is easy and free"
JotForm is a easy to use and has lots of options available for how to integrate the form. There could be a little more customization options. There are different subscription levels based on your needs. If you give the free version a try until you need to upgrade, you will be able to use 5 forms and 500 submissions--that gives you plenty of time to see what a great app it is! I am able to create forms and use in my sales funnels and on web pages. It makes it easy for people to fill out forms and submit because the forms are online and responses are emailed to you as well as saved on the website. "Forms don't have to be complicated"
JotForm has made our form creation process so much easier. We like the fact we can see what our forms will look like when they are viewed on different platforms and this makes us feel comfortable that our users are getting a good experience when they fill out one of our forms. We also appreciated how easy it is to create HIPAA compliant forms. We dislike the fact that we have not moved to JotForm earlier, but as an administrative staff we are glad we made the jump and are here now! While we have only one admin creating the forms, it will be good to have others know how to create forms with this product--only one admin can be a negative when we have so many forms to create and often create a new form on the fly. As far as product negatives, I have not yet seen any negatives for this product from my perspective as user. I recommend other users give JotForm a try. Our admin team is happy with the product both as users and as the person creating the forms. Ease of use is a big deal for all involved. With this new way of creating forms we are meeting HIPAA compliance when necessary. We are also able to easily link payments with our current financial system as well as with other apps we are using. As a user of the JotForm link in my communication efforts, I am happy with the look and high quality of the forms for the links I am embedding on our website and using in other ways to communicate with church members and attenders. "JotForm for Clients - B+/A-"
When it comes to JotForm, I'm a big fan of their advanced design interface for customizing your forms, which is super user friendly. Additionally, they offer multiple integration options including lightbox, pop-up form, embed, link, etc. all of which I have used successfully. You can even customize these to an extent, like the lightbox form, which is typically not offered for free on other platforms. Lastly, I like that JotForm is free for the first 5 forms. If you aren't anticipating high volume, this is a great option. The initial building portion of the interface could be more user-friendly. The way you integrate products and payment is a little bit counter-intuitive, but not impossible to do. Even after doing it a number of times I have to pause and remember the course I took last to modify the products on a form. Wish it didn't have the JotForm logo on the bottom of embedded forms, but that's what you typically get with free versions, so I can't complain too much! Give it a try. If you're looking for a free app, this is not spammy at all, it's well designed and easy enough to use. JotForm has allowed me to create versatile and dynamic forms for my clients with payment integration that I can easily embed in their SquareSpace and GoDaddy websites with ease. My clients appreciate having all of their form information that visitors insert in one place and being able to export it and combine with other newsletter lists. It has enabled small businesses to take payments for services, larger companies to receive job applications with attachments, and all of my clients to utilize very professional-looking forms on their sites. "Intuitive tool, perfect for surveys!" I like the options Jotform has to a) compile results into a spreadsheet automatically, b) send an email with results once a form entry has been completed, and c) its integration availability with Google Drive, etc. I dislike the way the forms display in a mobile browser. For example, if I were to open a form link that I received via email, the checkboxes are too small on my 5” mobile screen. Additional optimization for mobile use would be a great improvement. We use Jotform namely for tenant feedback and RSVPs to special events. It’s great to send out a simple link and have results quickly and without having to manually enter any data. This is VERY attractive to me, and is one of the reasons I continue to use jotform. "Great, Easy but not without it's flaws..."
I like the ease and speed in which you can easily build a form for any use. Have an issue? Hope you don't mind digging through message boards. No way of interacting directly with a human representing the company which I find highly inconvenient. We have also experienced difficulty with some of the integrations and getting them set up and working as they were intended. Great software, easy to use, cross your fingers regarding any issues that may involve customer support. If you go in knowing that, you are not likely to be disappointed. Simple and easy to create and modify styles from form to thank you page. Overall, I give it a thumbs up. Jot Form is simple to use and the customer support is great. A lot of more options if you need them. There has been nothing I haven't been able to do. And if there is a problem they are very responsive. I highly recommend the paid and the free version of JotForm, what a pleasure to use the free version without any ads like so many other programs. I've used the software for membership profiles, client surveys and more. It's great to be able to use the graphs and charts made up of the results. "EASY WAY TO CREATE FORMS FOR CLIENTS TO USE"
I am very frugal, so the monthly pricing are okay, but the only thing i wish was that this service was free! We have a high demand from our clients to work on their requests. We use jotform as the main point for ALL of our clients to submit information we need to assist them. This in turn allows us to grab from this main POINT and in turn eliminates 5 steps for us. "A low cost and easy way to generate online forms quickly"
JotForm is simple to use and has lots of high quality templates for us to choose from. Though many of the templates are great as they are, it's great that we can edit them further to suit our needs. The editing and customization tools that JotForm provides are concise and don't require any specialized programming knowledge to use. Since online forms that are processed through our own PHP files can be problematic due to server, software and maintenance issues, using a separately hosted form through JotForm helps to make form submissions more reliable. JotForm's technical support also provides us with a critical resource for fixing potential errors that may occur. Though JotForm is suitable for most of our business forms, there are a few types of forms we need that are too complex to create with JotForm. It would be nice to integrate more of our own coding to allow for more precise functionality of the forms. Also, the visual design capabilities can be somewhat limited for certain forms. This can be problematic when you have very precise design and branding requirements. When posting form links to social media or other places, I would recommend creating redirect links in your website that go to the forms. This will allow you to post links with your website's web address instead of form with JotForm's generic link. This should help people become more aware of your website and brand. JotForm has been a great way to create simple and effective online submission forms that we can use for marketing, event registrations, surveys and other types of feedback. The data we obtain is extremely valuable for planning promotions and events and making overall business decisions. Using JotForm forms helps us to extend our social media capabilities by adding our form links to our social media posts. * We monitor all JotForm reviews to prevent fraudulent reviews and keep review quality high. We do not post reviews by company employees or direct competitors. Validated reviews require the user to submit a screenshot of the product containing their user ID, in order to verify a user is an actual user of the product. Hi there! Are you looking to implement a solution like JotForm?